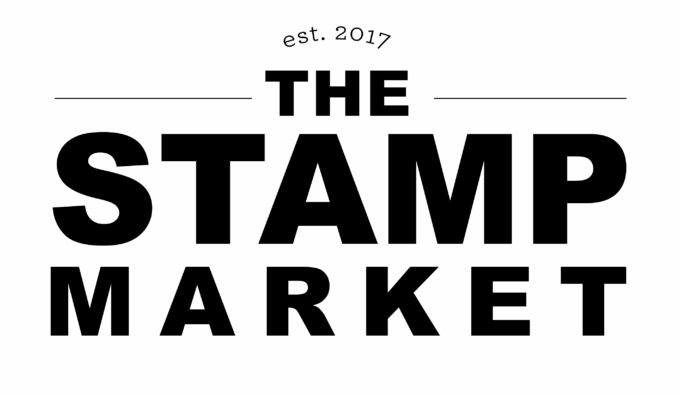 Welcome to Day 1 of the Papertrey Ink, October Release Countdown. 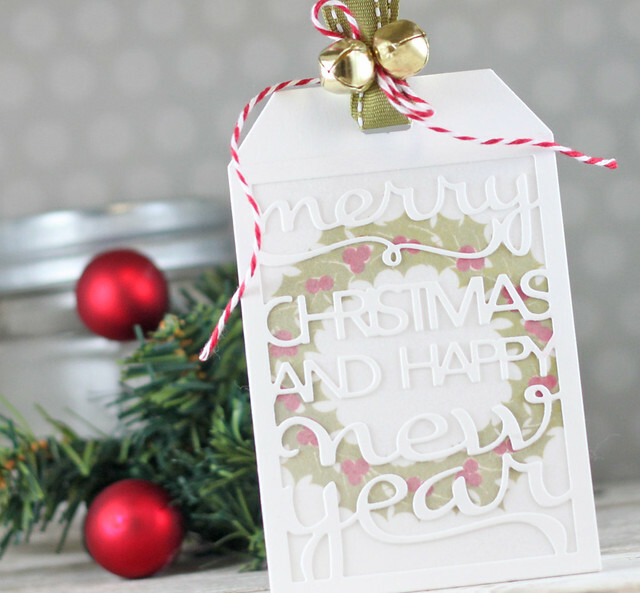 This release is full of some gorgeous new Christmas goodies, paper and.....a new color! Today I am showcasing the new set called Enclosed: Wreath. For this first card, I used Sentiment Splits: Curve Vertical Die and the new Pure Poppy + White Basics Paper to create the card front. I cut a wreath die and stamped the leaves and berries in Simply Chartreuse, Pure Poppy and Scarlet Jewel. I cut the 'peace' out in Gold Adhesive Paper to frame the wreath. And to finish it off, I added dots of Glossy Accents to the wreath to make the berries pop. ....fits perfectly with the Text Block dies. I used the Text Block: Christmas die for this tag. 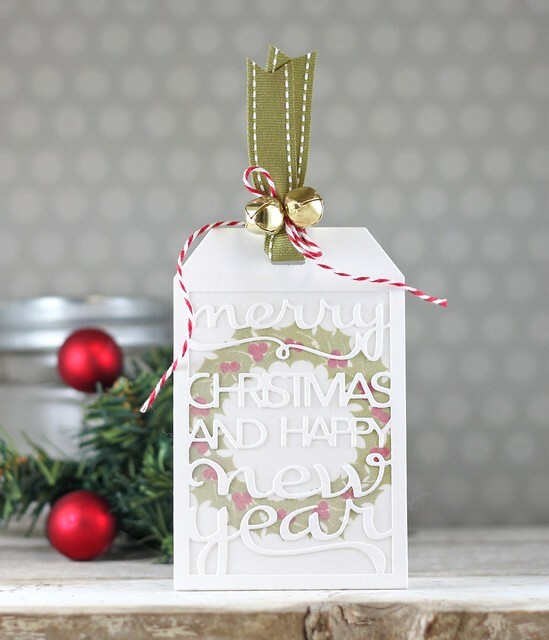 I added it in white with a layer of vellum behind it, after stamping the Enclosed: Wreath on the journal card base. I added in some Ripe Avocado Saddle Stitch Ribbon and bells tied with red twine to finish of the card. For my last card, I made one with a little different size. This card is 5 1/2" x 3 3/4". I used Basic Bookmark 3 in the background but cut out only the bottom of the bookmark to use on the top and bottom of the background piece. 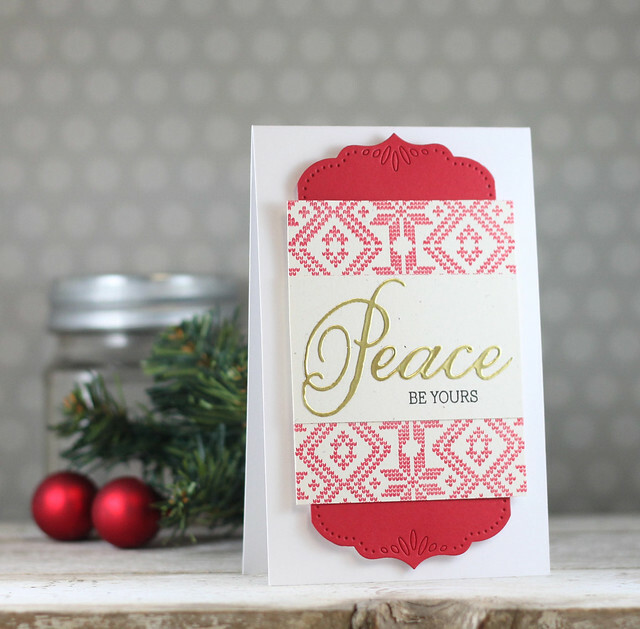 Next, I stamped the Rustic White panel with the new Fair Isle Borders in Pure Poppy. I cut out the sentiment only in the Enclosed: Wreath frame in Gold Adhesive paper and then stamped the rest of the sentiment in black ink. I hope you have enjoyed today's projects. 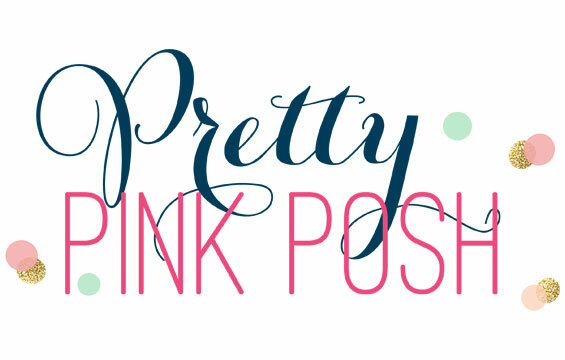 There is lots more to see over at Nichole's blog. I'll be back in a few days with the first group post for October. Hope to see you then! Beautiful CAS trio of cards! Laurie, your cards are all so pretty! I really like your tag idea with the wreath showing through. I love your text block with vellum tag. So pretty. Thanks for all your examples. Your Clean and Simple cards are elegant. I like the tag in particular with the wreath peaking through the vellum and behind your sentiment. Great tags and card. Great set of tags! the wreath is lovely, and you showcased it beautifully! I really think the clean and simple style looks so professional. 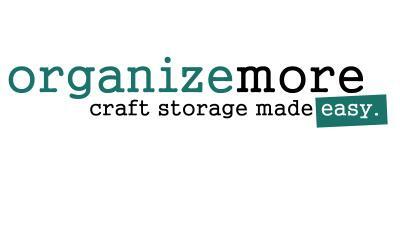 I really like the color combinations you have chosen for your projects. Wonderful projects. Love the wreath and how you used it. Laurie these are all wonderful! I love the simple beauty that each of your projects always has! Gorgeous!!!! Your velum tag is so pretty! Great inspiration today (as always). Oh what pretty projects!! I LOVE that new wreath!! Beautiful projects! I especially love your tall and skinny card (wishful thinking, maybe?). Love these! Love your CAS style! OMG Girl!!! You hit it out of the park with these cards!!! For the life of me I can't choose one over the other! Love your vellum tag. Beautiful! 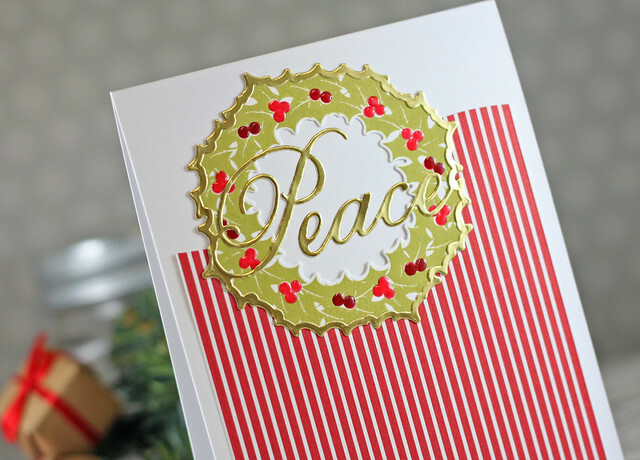 You're so creative to put the die cut over the vellum, which is over the wreath design! I just love that look! Thanks so much for the inspiration! Gorgeous projects, Laurie! I love all the touches of gold!!! 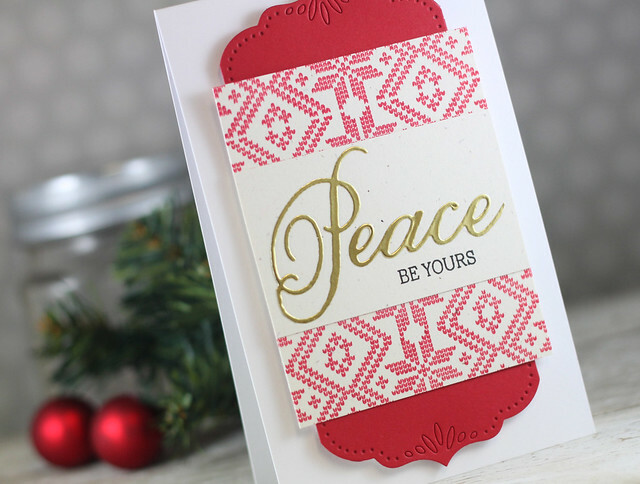 Gorgeous Laurie, i love that wreath with the gold edging and Peace inside, and the new fair isle prints are great too, your tag is so classically beautiful. 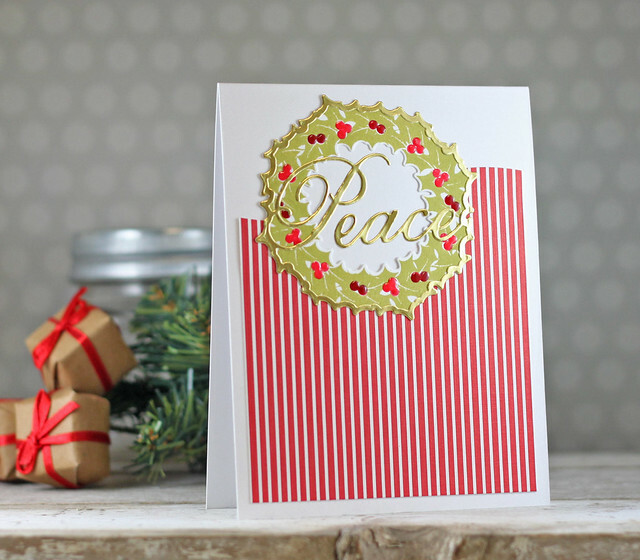 Gorgeous cards and tag! Wonderful release! This is my favorite enclosed yet, and that last card, is just perfect in every way. Love the balance and the die cuts you used to bracket the panel.